Prof. Gail Barber passed away on November 19th. Gail lived a full life. Her music career began with the piano, and her first recital took place when she was 13 years old and living in Mexico City. I want to discuss her career, our friendship, and well as a little bit about her family. She was the eldest of four children. Her father passed away at age 54. One brother also died at age 54, and her son, David, died on December 1st, also at age 54. They never told David that his mother had died. The family lost two members in less than a fortnight. David Barber was married to Stacey Barber and they have two sons, Brandon and Travis. Gail also had a daughter who is organizing a concert on February 24th in which students will play original compositions by Gail. The concert will be held at 1:30 pm at the Kent R. Hance Chapel at Texas Tech University where Gail was a tenured Professor of Harp and Music Theory from 1966-2015. The address is: 2511 17th Street, Lubbock, Texas 79401. Those who wish to make memorial donations in Gail Barber’s name can send them to the American Harp Society in Dallas or Texas Tech School of Music. Texas Tech School of Music, Attention Rachel Mazzucco, 2624 18th Street, Box 42033, Lubbock, Texas 49409. As someone who knew Gail very well, I would like to say that I believe the family has made a generous decision that is consistent with the life efforts of the person I knew. Gail’s own career was helped in part by a very devoted father and mentors at the Eastman School of Music, including some famous conductors such as Howard Hanson and Erich Leinsdorf. Musical talent often exhibits very early in life, but opportunities have to be created. Gail spent a lot of time listening to demo recordings, judging competitions around the world, and recruiting. She also gave concerts to raise funds for scholarships and often dipped into her own pocket to aid students. I am quite certain she would be proud of her family for continuing her mission to discover and assist talented musicians, especially, of course, harpists. Gail and I met in person in 1995 when she was performing the premier of a new composition for harp for the Santa Fe Desert Chorale. Unfortunately, I do not recall the name of the composer. I do however remember watching her mark up the score so that all the pedal changes were made at the right time. It was fascinating for me to “discover the harp”. As noted, we “met” in 1995, but Gail had actually first come across my work in 1977 when someone sitting in the front row of a lecture I gave at a university in Memphis recorded the talk. It was one of the more esoteric lectures I ever gave, and she had wanted to meet me for some years. At the time we finally meet, Gail had been approached by a hospice group about playing for a fund raiser for HIV infected patients. She wanted to compose something new that could be played for people in transition, and I believe this concept was actually very dear to her. However, what happened was that while she was staying in Santa Fe, we attended some operas and other performances and I mentioned that some of the fully functional people on stage were actually persons I had been helping through their challenges with AIDS. Without any real discussion, the emphasis shifted gradually from transitioning to healing, and, to tell you the truth, I do not remember much further discussion about transitioning except that on several occasions, Gail took harps to hospitals and played for people. Some of the patients had been patrons of the School of Music and some were members of the orchestra or personal friends. Gail had a very big heart and often gave generously of herself, her talents, and her time. So, rewind a bit. Gail and I rendezvoused at a Chinese restaurant in Santa Fe where we toasted “Music and Mystery” and thus began an extraordinary friendship and journey. We spent almost the entire summer in altered states of consciousness. She heard and saw the music she was to compose in the future. I remember one utterly amazing experience in which I saw the two fish of Pisces and immediately named them Music and Mystery. I went inside Mystery but immediately heard the most glorious music I ever heard in my life. There were thousands of voices, all blending in the most amazing way but way in the back, the tail of Mystery, I saw an incredible hospital with people who were receiving the most loving care, much of it assisted by music. About 15 years before we met, I had written a book on music therapy called Shadows on the Soul. It is still unpublished. I sent it to over 30 publishers, all of whom said it was fascinating but did not fit with the other titles they market. Obviously, Gail and I discussed the book and the mechanisms whereby music can realign energies. There was, of course, a context for everything. At that time, 1995, Harp Therapy was beginning to be recognized as a potentially useful component of a healing program, but the way it was being presented required patients to learn to play the harp. The theory was that the harp is designed in a way that the sound is somehow pulled towards the body. Yes, the way the harp is played could lead one to think this, but the reality for a performer is that the sound also has to reach the last row of the concert hall and Gail was famous for her sound. Being an opera buff, I sort of translated concepts from harp to vocal music but one can think of a soprano with a voice that can fill the hall or a singer who needs a microphone to be heard. 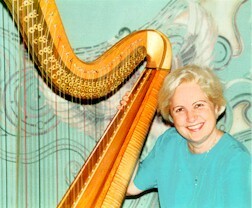 It is the same with harps, and concert performances are not generally amplified. As fate would have it, Gail and I became deeply involved with music therapy, but she remained a composer and stage performer as well. For instance, a flamenco group asked her compose a piece to fill a necessary costume change interval. I think the program was called “Lace and Fire” and I attended all the performances and captured two of them on DAT tape. The rehearsals were in my living room, where the picture above was taken, and I was introduced to the tensions and traumas of the backstage world. This greatly enriched my appreciation for the dedication and sacrifices of those who do so much to enhance the quality of our lives. In 1985, Gail had composed a delightful piece called “A Turkish Fantasy”. It has little musical scenes of fountains, sword dances, haggling in bazaars, and moonlight on the Bosphorus, each followed by a story teller. The audience at the Istanbul Music Festival went wild. She went on national television the next day for an encore performance. For the flamenco group, she composed a piece that I named the “Iberian Fantasy” because besides having a Spanish feel, Gail was born in New Iberia so it felt fitting. In her 80 years as Gail, she was actually approaching the end of her major composing career when we met. Only a few more pieces followed, one a very solemn piece with Egyptian inspiration that was part of a CD with solos by many harpists and the rest of the original work was improvised for individual healing sessions and very seldom recorded though I often hid tape recorders and tried to archive a little of what I was blessed to be hearing. Only months after we met, I was bitten up and down my left leg by a spider. There were at least 14 puncture wounds and the pain was excruciating. I learned so much about friendship in the year it took to be able to walk again. Gail was the best friend anyone could ever hope to have, and I am so grateful to have had the experience of knowing her both as a creative artist and friend. I think there are times when the people we know are only seen in one role. For instance, we may see someone as a teacher or performer or friend, but Gail and I did so much together. I used to listen to the tapes of competitions, and we would compare notes with each other. I am not a harpist nor even a musician, but I have ears and appreciation. Gail always called it “discernment”. As time went on, Gail was awarded an honorary doctorate of medicine degree for her contributions to music healing. She traveled extensively: China, Israel, Scotland, Vienna, Istanbul, Sri Lanka, France, and throughout the U.S. She gave performances at conferences, both harp conventions and alternative medicine gatherings. Her music was always deeply appreciated and some people, still today, tell me their lives changed irrevocably after exposure to her playing. I remember the first time she played for me. She was a house guest of a patron of the Santa Fe Desert Chorale and the room was very small, but she wanted to introduce me to her music. She played some Bach and tears rolled down my cheeks. That was it. She had wanted to see how I listen to music and the tears said it all. Gail had a full life. She had family, friends, deep experiences, opportunities, and challenges. She was, of course, very sensitive as well as brilliant. Sensitivity can be a two-edged sword and she was very troubled by chemicals, some of which were nearly inescapable. We find them in food, in the air, in water and soil, and even in our clothing. She was the type of person who actually needed protection from such exposures, but no one can escape chemicals in the world we have today. She suffered enormously from chemicals and had to battle for stability to meet all the demands on her time. It is not easy to teach by day and then have rehearsals and performances until late at night, only to return to a hotel room with strange odors. This was an ongoing problem for which she never had an adequate solution. The other side of sensitivity is deep insight and understanding so if one needed or wanted to go beyond the superficial, her insights and understanding were precious. Many people have asked what happens when we transition. If anyone was ever prepared, it ought to have been Gail because she spent a lot of time peeking behind the veil. The Gail I knew did not have a mean bone in her body. She was a fundamentally joyous person who easily laughed and sometimes giggled. She was strong, supportive, giving, and very maternal in a nurturing kind of way. If we are rewarded for our good deeds, then I am sure the angels are jubilant about reuniting with one of their kin.